Brandon is a quintessential small town with a village feel. It is conveniently situated in west-central Vermont, midway between Middlebury and Rutland. Brandon is a study in early American architecture and Vermont history. The area was rich in natural resources with excellent farmland along the rivers and abundant supplies of timber and minerals. The town flourished during the 1800s with several industries relying on the key resources of water power, iron ore and marble. The coming of the railroad enabled the manufacture and shipping of iron-based products such as the Howe scale, as well as Brandon paints, wood products and marble. 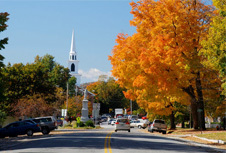 Brandon is a special Vermont town full of art, culture and history! Search the latest listings for sale in Brandon, VT below. If you have any questions or would like more information on a property - contact us. You can also sign up for a free account to save your top listings and get updates when similar listings come on the market. Imagine life in a classic New England town ~ Brandon dubbed the Art & Soul Village of Vermont, where you can experience the best of both worlds: a vibrant, walkable center of art galleries, studios, shops, and restaurants, and easy access to the best of four-season outdoor recreation. And we have just the home for you - a stylish and lovingly cared for home featuring stenciled wood floors, open airy rooms, custom light fixtures, period details such as curved walls and exposed brick, built-ins, sliding barn door repurposed from antique barn on site and so much more! Recent enhancements include BRAND new bath with tile step-in shower, NEW kitchen, new sheet rock, updated electrical and plumbing and freshly painted interior. A favorite spot might be sitting on the front side porch or covered back porch overlooking the small easy to maintain yard. The antique barn offers option to park a car, project space for the "do it yourself" projects and full second story access for great storage. Enjoy this lovely Gambrel but contemporary style home on 20.59 acres with breathtaking mountain views. Sit on the enclosed porch or spacious deck and enjoy the view. Cathedral Ceilings in a large portion of the home. Upstairs Master bedroom with balcony overlooking the lower living area. Keep warm with a wood stove upstairs, one downstairs and a new Boiler furnace and oil tank. There is a large garage attached.. with separate entrances, the front stores two vehicles and the back has room for more. Large overhead space and attached wood shed. Barn for your animals. Separate pasture gate allows you to drive right around to the house and other garage. Water and power to all outside buildings. Perfect for anyone who enjoys four wheeling and snowmobiling. Trails throughout the property. Rural living at it's best..